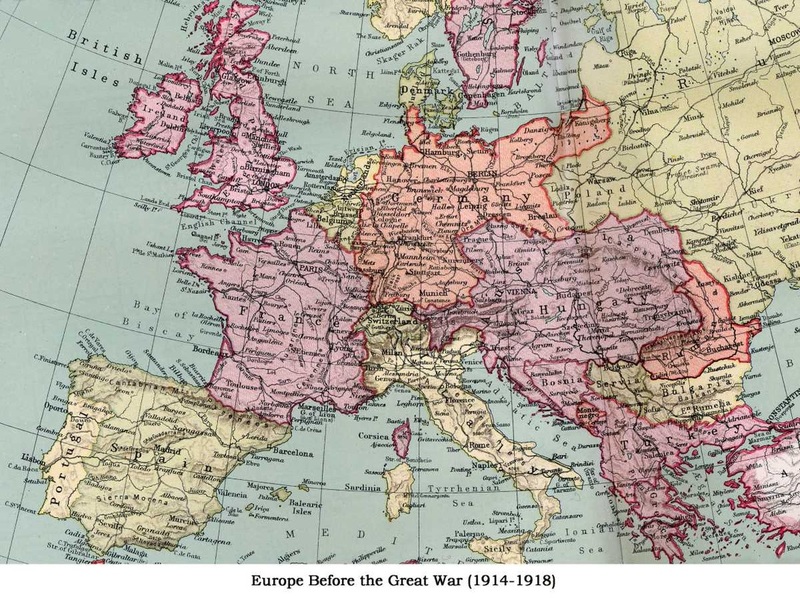 The CLPGS invites you make an imaginary journey through mainland Europe at some time in the opening years of the 20th century before the great cataclysm of the First World War destroyed the cream of a generation, toppled empires and kingdoms, and rewrote the map of our continent. Phonographically, this can be achieved by listening to contemporary records of music characteristic of the various countries we pass through. It would be invidious to suggest that three or four records for each country visited can possibly represent the musical wealth and diversity of those places, either then or now; however constraints of availability and space must inevitably take their toll and leave the listener with but an echo of the aural riches of our continent. Furthermore, the music chosen on this occasion is mostly of a popular nature, which leaves the rich operatic tradition of certain regions to be enjoyed in forthcoming concerts. The absence of music from Northern and Eastern Europe is not due to lack of fine singers and composers from those parts on cylinders. WHO’D LIKE TO PAY FOR MY HOLIDAY? Yolande Noble. Edison Bell 20099. c. 1910. Every holiday has a beginning and an end, and our tour is no exception. In this record, Yolande Noble, (we might imagine her as the beauty in the picture below), declares she needs a holiday, and will some nice young man take care of it all…and her! Yolande Noble was sister-in-law to the Australian baritone Peter Dawson. Let us imagine we have started our trip by taking a boat from Portsmouth or Plymouth and have sailed directly down to Santander or Bilbao, perhaps with a motorcar, with a view to touring the continent and enjoying some of its music on the way. 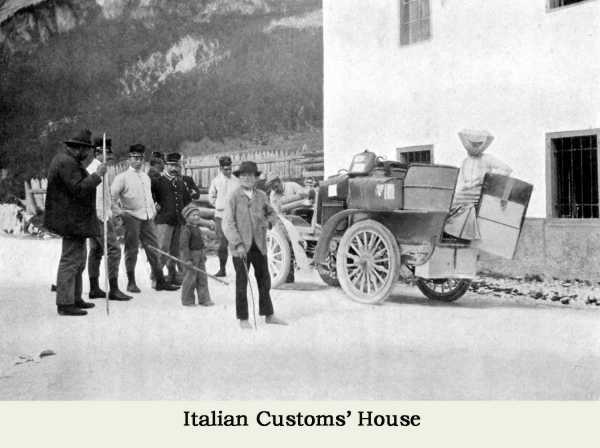 These are early days for motoring abroad, and after anxiously watching the car being unloaded from the boat by crane, we have to pay a customs’ deposit in cash on the value of the car, which is then fitted with a lead seal round the chassis so that the authorities know the money has been paid. On leaving Spain, we have to show our papers in order to redeem the deposit and be ready to do the same for France and every other country we pass through. Supplies of petrol are uncertain between cities, so enough has to be bought in one city in order to reach the next. It is prudent to telegraph on ahead in order to ensure availability. ALMA DE DIOS – Seguidillas de fuelle (Song of the Bellows). Music by Jose Serrano with words by Carlos Arniches. Sung by Pablo Garcia Bofil. Released in October 1910. Edison 22106.This is a song from a ‘zarzuela’, a particularly Spanish form of light opera with spoken dialogue. Zarzuelas take their name from the 17th century entertainments at the royal palace, La Zarzuela, near Madrid, itself named after the zarzas or thorn bushes in its vicinity. ALMA DE DIOS was first performed at the Teatro Comico, the 17th of December, 1907 and consisted of only one act depicting the troubles and joys of low life mixed in with Gypsy romance. It deals with the problems of two young cousins and an illegitimate baby that belongs to one of them, but nobody can tell which! One has made a good marriage and cannot risk repudiation, and the other has a boy- friend who is too good to lose. The matriarch of the piece is Ezequiela who gets to the bottom of it all, and caught up in all the mayhem is Matias, Ezequiela’s timid husband who is never happier than when tending his chestnut stand in the street. A characteristic of ALMA DE DIOS is that none of the important songs have much to do with the plot. In this instance, Sequidillas del fuelle, is what Matias sings as he uses his bellows to keep his chestnuts roasting nicely while he gossips and flirts suggestively with pretty young things passing by. Seguidillas are an Andalucian dance form, which involves interpolated song using alliteration or assonance of vowels within the words instead of rhymes. It is not unreasonable to suggest that we heard the above song in Madrid, so here is our car now leaving the capital and heading south for Andalusia. FLAMENCO. Flamenco is a form of music peculiar to Spain originating in the southern region of Andalusia. The provinces of Murcia and Extremadura have also played their role and many renowned native practitioners are not exclusively Andalusian. 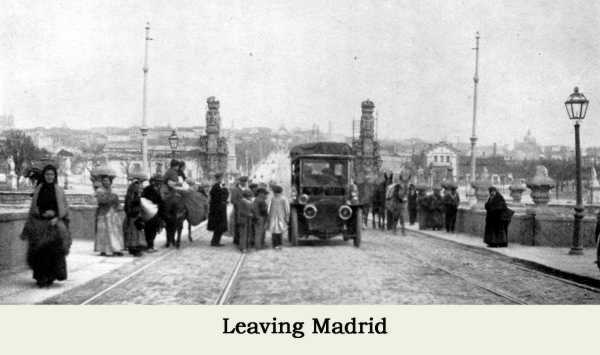 Spain, in spite of being at the end of Europe, has been a great thoroughfare of migration and conquest and as such, the influences which have been brought to bear on Flamenco music are not only Gypsy and Moorish, but also Sephardic or Ladino Jewish, Byzantine, Persian, Mozarabic and Italian, not to mention the Germanic Visigoths and the Vandals who are also supposed to have given their name to (v)Andalusia. It has influenced and been influenced by the music of Castile and other parts of Spain as well. It is characteristically powerful in tone and appearance, yet intricate with strict rules, which nevertheless permit of improvisation and spontaneity. Its three main elements are CANTE, or singing, BAILE, or dancing and TOQUE, or guitar playing. Cante and Toque we are now able to enjoy from the following two cylinders. GUAJIRAS ESPAÑOLES – Canzion andaluza. Sung by Lola La Flamenca. Edison 22339, originally released in May 1909. Guajiras are a type of Spanish dance with a rhythm alternating between 6-8 and 3-4 time; so the title really means Spanish Dances. A Cuban variety forms a narrative folk song. In addition to the Old World influences already mentioned, Spanish music generally has been much influenced by its South and Middle American Empire. 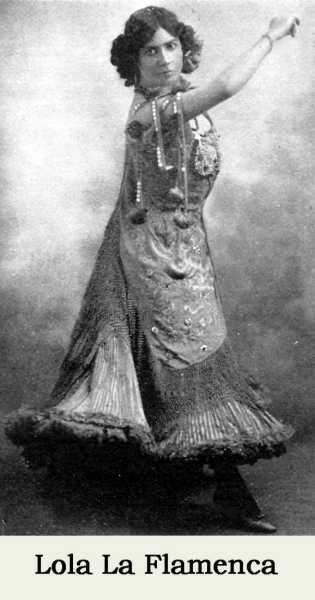 Lola La Flamenca was born in Seville and built a career of singing regional folk songs, seven of which were recorded by Edison in 1909 when she was in New York City, possibly with a number of other Spanish singers and musicians with the Anna Held Company for the production of a musical play called ‘Miss Innocence’. She performed in Paris and other European capital cities. SOLEARES – Aires Flamencos (Guitarra) Amalio Cuenca. Edison 22342 May 1909. The Soleares part of the title refers to the particular type of rhythm of the piece. The soleares are one of the most important of the styles of flamenco, in guitar playing, singing and dancing. The rhythm or compass consists of 12 beats with the accent on beats 3, 6, 8, 10 and 12. The rhythm taken care of, this record comprises a selection of popular flamenco tunes. Amalio Cuenca, according to the Edison Phonograph Monthly, had a “great reputation in Europe, and also in Mexico, where he played before President Diaz and was warmly praised by him’’. It should be noted that the guitar at that time had been out of fashion as a mainstream instrument since the 18th century, and was, until Andrés Segovia rescued it a generation later, largely relegated to folk music. To reach Paris from southern Spain, you might have chosen to hug the Mediterranean coast and cross the Pyrenees by the eastern option; but the classic route, the “Route d’Espagne”, would have entailed going back by Madrid, crossing the frontier at Biarritz and going up through France via Bordeau, Poitiers, Tours, Orléans and thence to Paris. 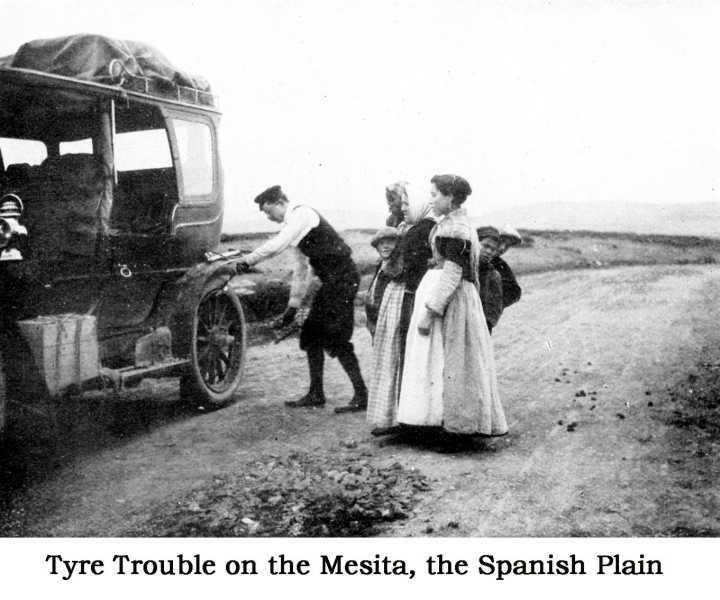 The photograph shows our car with problems on the stony roads of the Mesita, the central Spanish plain. 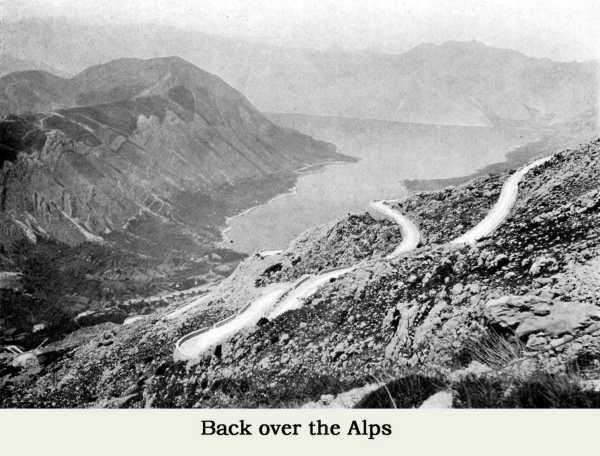 Spain has excellent roads now, but even 30 years ago, rough, lonely ribbons of tarmac crossed the brown and purple landscapes of this region with the same frayed stony edges as in this mid 1900s photograph. LA POLKA DES ENGLISH’S – Chansonette populaire sung by Charlus for Pathé Frères. Words by Felix Montrueil with music by Gabriel Allier. Issued in 1898. Chastening as it can be to see ourselves as other see us, it can also be quite diverting. Enjoy then the following scurrilous little number from the France of the Belle Époque. Voilà les English’s, ah! oui! ​Plats comme des sandwichs, ah! oui! Et bien d’autres choses aussi. On leur prend le tra la la. See there the English, aoh! yes! Flat as sandwiches, aoh! yes! Do you want ze lobstairs? How one takes their tra la la. CHARLUS, (his stage name), was born in 1860. After several false starts and a period of military service between 1881 and 1885, he began his stage career as an impersonator imitating Paulus, one of the great café concert stars of his time. His success in this line led him to share a billing in Paris with Yvette Guilbert who encouraged him in 1889 to develop his own stage character and he became a ‘diseur’ or monologist as well as singer. In 1896, he was introduced to Emile Pathé who was aware of his talent and invited him to test for the phonograph. This was successful, and with his clear diction and iron lungs, he was perfect for the then repetitive business of making phonograph records, three or four per round, for which he was paid 50 centimes (about 5d sterling before the Great War). He could mimic many of the great singers of his day and record their repertoire. In this respect, he corresponds to Harry Bluff on Edison Bell records or perhaps Burt Shepherd on British Pathé records. In about 1902, the moulded cylinder was introduced and he was paid the dizzy sum of 100 francs per master (about £4 sterling) but so many fewer masters were needed for the moulded record that his income took a tumble. By 1939, by his own account, more than 3,500,000 of his discs and cylinders had been sold. He had had an illustrious stage career before record making and had made many contacts and friends and finally Pathé Frères made him manager of their branch in Marseilles, which set him up again. His last recordings were made in 1930 when he was 70. He lived on into his 90s, upheld and serene in his deep Christian faith. EN QUATRE-VINGT-TREIZE (In 1793) sung by Henriette Leblond. Words by Armand Foucher, with music by Leo Daniderff. Edison 27161, released in October 1911. Our Victorian songs with their tragic events and maudlin’ sentimentality are in no way the monopoly of the Anglo-Saxon nations. Their French equivalents are if anything even more spectacular, especially when raw emotions are intensified against the backdrop of the French Revolution (1789-1793), which has left such a shadow, not only on France, but also on the last two centuries of European history. This song is set at the height of the Terror when denunciations, paranoia and treachery were at their zenith. Follow the words and judge for yourselves. In a middle verse not sung on this record, the police come for Lison’s beau. She hides him, but when an officer says, “the bird has flown, his betrothed will be happy”, she is overcome with jealousy and denounces him. He declares his love all the same and says the executioner’s work is already half done because his love for Lison has already made him lose his head. She is now profoundly overcome with remorse. Le peuple entier se rue aux armes! Avec une autre se marie! Puisque c’est toi seule que j’aime! Ne peut faire perdre la tête. On danse autour de la machine! “Grâce pour lui mon bien-aimé! Pour toujours a perdu la tête! The whole population is rushing to arms! Because it is you alone that I love! Can’t make a person lose his head. And dance round the machine! “Have mercy on my beloved! Has forever lost her head! 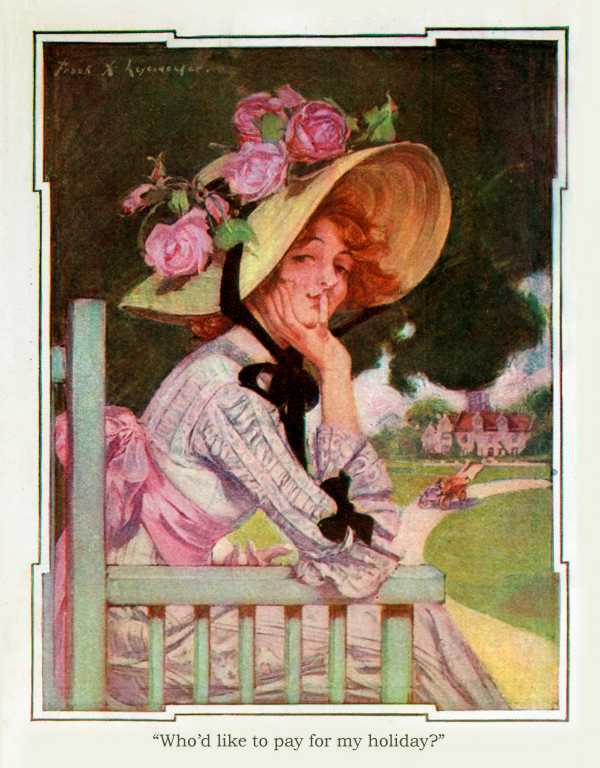 HENRIETTE LEBLOND, who was the main interpreter of this song in 1910, was born in Provence in 1877. She had a long and successful career in the music halls of Paris, beginning, as the billings show, in about 1900 at the Casino Saint Martin. This continued on and on into the 1930s. About the time this record was made, in 1910 and 1911, she made three silent films and later between 1931 and 1934, three talking films. Her last appearance was at the Folies Belleville in 1936 at the age of 59. She died in Bordeaux in 1938. JE SUIS POCHARDE (Words by Leon Laroche with music by Louis Byrec). Sung by Mme Rollini des Folies Bergères. Edison 17798. Released in October 1907. First sung in 1890. As Paris has its dramatic moments, so also its inhabitants know how to have fun - in this case, Mme Rollini’s character has had a little too much fun, as we shall hear! Of Mme Rollini, not too much is known. She appears in Pathé catalogues from 1896 to 1922, but from 1903 there are no new titles, which suggests that she broke with that company. However, she features on many other companies’ lists including Edison’s. She was a good mimic and could render other singers’ songs effectively, which was an invaluable skill in the early days of recording. Mme Rollini rode the wave of a fashion in the 1890s for Tyrolian style songs with yodelling, among them “Les Canards Tyroliens” (The Tyrolian Ducks)! There is a photograph of Mme Rollini on a website dedicated to French popular song called “Du Temps des cerises au Feuilles mortes”:www.chanson.udenap.org . Et j’ai pincé mon petit plumet. Quand j’ai bu du Moët et Chandon. Qu’est-ce que vous voulez que je vous dise? Quand j’ai quequ’fois Mariann’ dans l’œil. Et d’aimer le Moët et Chandon. And I’m very slightly drunk. When I’ve drunk Moët et Chandon. Away with your gloomy faces! When I’ve sometimes Britannia in the eye. And to like Moët et Chandon. GALATHÉE – Aimons, il faut aimer. (Victor Massé) Sung by Rose Heilbronner and Paul Payan. Edison 27098, first released October 1911..
Galathée is a light opera in two acts, first performed the 14th of April 1852 at the Opéra Comique in Paris. The characters are, Pygmalion the sculptor, Midas, a patron of the arts, Ganymede, Pygmalion’s servant and Galathée, Pygmalion’s statue come to life. Pygmalion’s statue of Galathée is so bewitchingly beautiful that he does not wish to sell it to the very insistent Midas. Venus hears Pygmalion’s prayer to bring the statue to life so that it cannot be sold, but the now fleshly statue Galathée has a mind of its own and loves everyone but Pygmalion. The resulting confusion leaves everyone relieved when Galathée is turned back into stone again complete with the jewels Midas had given her. VICTOR MASSÉ was born in Lorient, Britanny, in 1822 and died in Paris in 1884. He entered the Paris Conservatory at the age of 12 and eventually won the “Prix de Rome” after studying with Jacques Halévy in 1844. 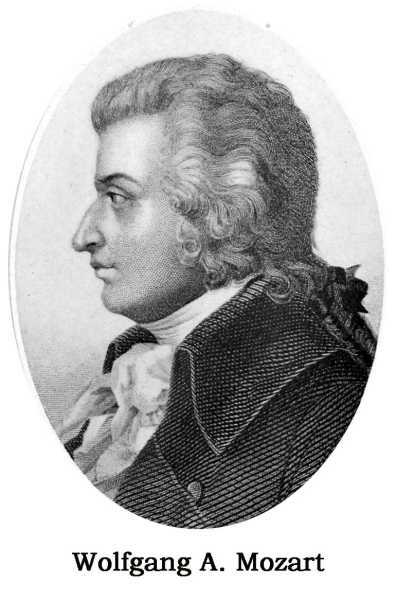 His compositions include comic operas, operas, cantatas, masses and many songs and romances. His best-known and most successful work is perhaps “Les Noces de Jeanette”, 1853. ROSE HEILBRONNER was born in Paris in 1884 and her debut was at the Opéra Comique in 1907 in Gluck’s “Iphigenie en Aulis” . Other roles were Micaela, Pamina, Donna Elvira and Eurydice. She was at the Monnaie in Brussels from 1919-1922 and also performed at Vichy, Marseilles, Montecarlo and other French cities. PAUL PAYAN 1878- 1959. He was a fine bass who studied at the Conservatoire Nationale in Paris under Isnardon. 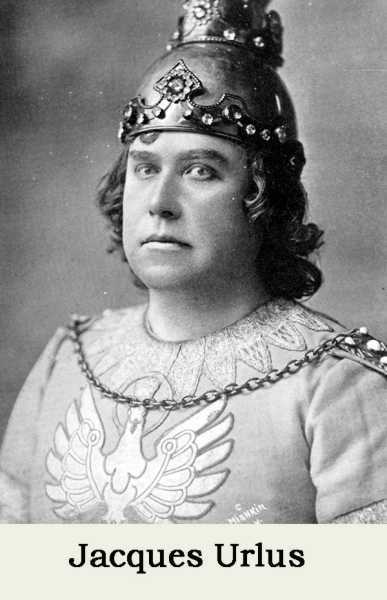 In 1906, he was engaged by Albert Carré for the Opéra Comique where he sang bass roles for many years. He later moved over to the Paris Opéra and did many tours of the provinces. From 1921-22 he was a member of the Chicago Opera where he performed in Massenet’s “Jongleur de Notre Dame”, and “Manon” , in Gounod’s “Romeo et Juliette” and Saint Saens’ “Samson and Delilah”. In 1924 he was guest singer at the Teatro Colon in Buenos Aires and in 1928 he was guest singer at London’s Covent Garden. He later retired and taught in Paris. INNO DI GARIBALDI (Words by Luigi Mercantini with music by Alessio Olivieri). Sung by Ettore Campana. Edison 22474, first released September 1911. In view of Italy’s colourful and volatile political life, it would be difficult on a tour either today or at the beginning of the 20th century, not to be aware of it in some way or other. So with the transformation achieved in the 19th century from a collection of city states, many of them ruled by foreign crowns, to a modern unitary state occupying the whole peninsula, and Garibaldi’s role in all this being significant, it does not seem inappropriate to hear Garibaldi’s anthem. With apologies to Dante for the weak translation from the Italian! GIUSEPPE GARIBALDI (1807 – 1882) was an Italian patriot and warrior who helped unite the Italians and free them from foreign rule. In a series of bold campaigns from 1848, some involving skilled guerrilla warfare, he eventually drove the Austrians out of Italy. The garbled translation of the last verse of the anthem refers to the occasion in 1860 when he and his red-shirts took Sicily in the name of Victor Emanuel II. I martiri nostri son tutti risorti! Su al vento per tutto le nostre bandiere. Su, tutti col nome d’Italia nel cor. Va fuori d’Italia, va fuori ch’e l’ora! Va fuori d’Italia, va fuori o stranier! ritorni qual’era la terra del armi! Ma ancor di Legnano sa i ferri brandir. Gia troppo son gli anni che dura il servir. Dei Mille la schiera che l’Etna assalto. Our martyrs are all raised again! Into the wind with all our banners. Onward, everyone with Italy’s name to heart. Out of Italy, go out, for now is the hour! Out of Italy, go out, o foreigner! Return, what was the land of arms! Yet from Legnano she can brandish iron. Already too many a year has servitude endured. The band of thousands will take up arms. The faithful warrior’s doughty charger. TARANTELLA SICILIANA (Frank Lucanese) The Three Vagrants. Edison 4187. Released for March 1921. 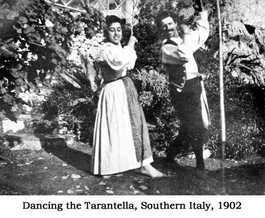 The tarantella is a traditional dance of southern Italy in 6/8 or 4/4 time. There are variants of the dance including the Neapolitan, Sicilian, Apulian and Calabrian tarantellas. It appears to take its name from a town in southern Italy named Taranto and it is associated with the local wolf spider which can be over plentiful in the fields of the region. Traditionally, if someone is bitten by the spider, the victim has to dance vigorously to prevent the venom taking effect, probably by raising the body’s metabolism till the toxin is broken down. You danced and your neighbours took turns to accompany you until you were recovered. It is also a good and sprightly dance and our Edwardian motorists brought home this photograph. CARME, TU NASCISTE PER ME (Capolongo) Gennaro Pasquariello. Edison 22476. First released in July 1912. 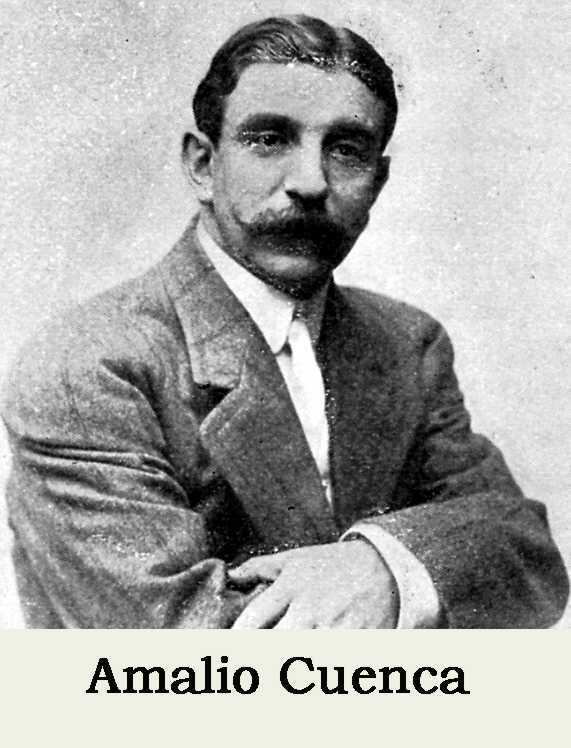 This lovely Neapolitan song whose title means “Carmen, You Were Born For Me”, is one of four issued by the Edison Company sung by a most enchanting singer called Gennaro Pasquariello (1869-1959). After trying many careers, he got himself a job in a restaurant as a singer. His soft lyrical voice suited the small space but was easily lost in the babble of voices. The owner of the restaurant was amazed when, such was the beautiful quality of his voice, all the diners stopped chatting and placing their orders, and the waiters stopped serving to listen to him. All was religious hush! That night, he was discovered and he quickly found himself in demand all over Europe, especially in Paris, London and Vienna. Everybody wanted to hear him, even the likes of Puccini and Toscanini. He retired in 1940. Unfortunately, inflation devoured his savings and in spite of his reputedly careful ways, he finished his life in relative poverty. But such was his status in the world of Neapolitan music, that a number of daily newspapers organised a subscription for him. We now have to cross the Alps back into that great Empire so much resisted and fought against by Garibaldi. 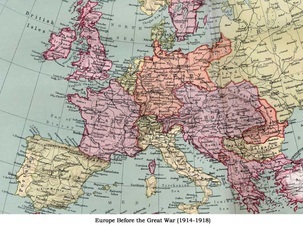 You will see on the map that the Austro-Hungarian Empire was huge and it is impossible to do it justice with just a handful of songs. With such an area and so many different peoples, and some 13 different languages, the variety of folk music from shepherds’ lays in the Carpathian mountains to the exquisitely sweet café songs in Vienna to the alpine flavoured dances of Bavaria and Tyrol, not to mention the huge numbers of composers, classical and otherwise, many of whose names are still in our minds, the variety is simply staggering. However, the choice is made easier by the comparatively limited choice available on surviving cylinder recordings. KUKUSCHKA – Russian Peasant Dance. (Franz Lehar) played by Sousa’s Band. Edison 4 minute 474, issued in June 1910. Lehar was born in 1870. At 15, he entered the Prague Music Conservatory where he studied violin and composition. He entered the army and at the age of twenty, became its youngest bandmaster. He was given a posting in Pola on the Adriatic with a 110-piece orchestra, which allowed him to perfect orchestration technique. His collaboration with a naval officer, Felix Falzari, resulted in his first opera, “KUKUSCHKA” which was first performed in Leipzig and Budapest in 1896. Though quite successful, its returns were not enough for him to live on as a composer so he rejoined the army, which sustained him until he was posted to Vienna in 1902. 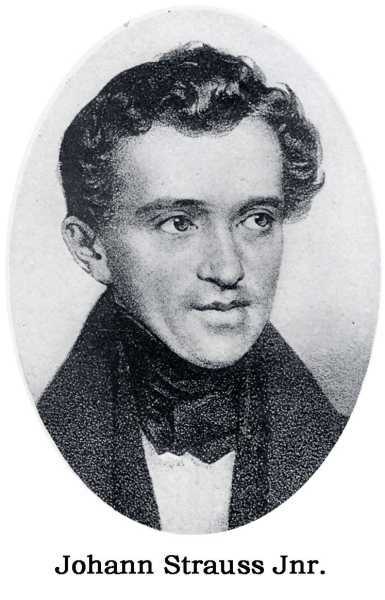 The waltz he wrote for Princess Metternich’s Gold and Silver Ball (The Gold and Silver Waltz) launched his public music career and on leaving the army again, he had the post of Kapellmeister of the Theater an der Wien. Enjoy now, some music from his first attempt at opera. He lived until 1948. ROSES FROM THE SOUTH WALTZ (Johann Strauss the Younger) played by Issler’s orchestra. Anonymous make, c. 1898. It would be inverted snobbery not to include one of the ever-popular Strauss waltzes. The early date of this record is evidence enough of their universal appeal at a time when record catalogues were still very limited in the range of their offerings. Edward Issler was employed as early as 1891as pianist to the Edison recording studio. His verve and versatility made him a great hit with both the studio and the record buying public, so he soon set up a very small orchestra that was ideal for the recording apparatus of the time. His performances are unusually lively and have a good sense of rhythm, which is a remarkable feat when you are obliged to play a given piece all day long to supply enough master records for the duplication process then in use. This particular cylinder is so well preserved; it shows you just how good the records of the 1890s made for the general public could be. SECOND HUNGARIAN RHAPSODY by Franz Liszt, played by the Royal Military Band. Edison Bell 10035, released in December 1906. As a Hungarian composer, Liszt is an obvious choice for this part of the programme. 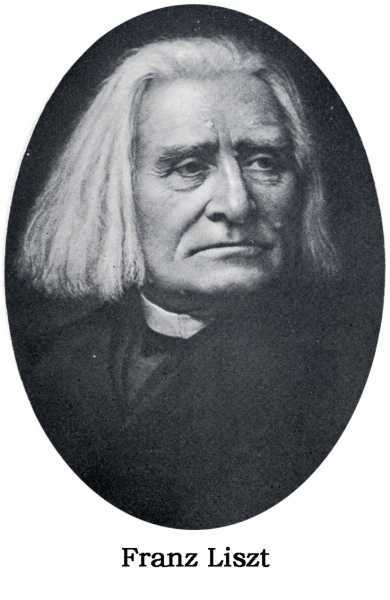 The Hungarian Rhapsodies were some of Liszt’s most popular pieces and were originally composed for the piano, but on early recordings, they are frequently scored for a small concert band, good piano recordings being difficult to achieve before the teens of the twentieth century. HEJRE KATI No. 4, Opus 32 by Jenõ Hubay and played by the Moss Squire Celeste Orchestra. Edison 23321, April 1914.This record is of a favourite Hungarian concert piece, one of fourteen czardases composed by Jenõ Hubay. He was born in Pest, now Budapest in 1858. He studied violin with his father, Karoly Huber, who was leader and conductor of the orchestra at the National Theatre and violin instructor at the National Conservatorium. His career as a student and then as a mature musician was blessed with association with musicians and composers such as the violinist Joseph Joachim, the composer Franz Liszt and the French composer Henri Vieuxtemps. He made a name for himself in Paris in 1878 and thereafter travelled the whole of Europe giving concerts. Vieuxtemps recommended him for the post of professor of violin at the Brussels Conservatory, which the King of Belgium confirmed, and then he returned to Hungary in 1886 to take up the post of head of the violin school in the Budapest Academy of Music. From 1919 to 1934, he was director of this establishment where he created one of the world’s leading violin schools. MARRIAGE OF FIGARO OVERTURE (Wolfgang A. Mozart). Played by the Edison Concert Band. Edison 9781. January 1908. The opera was composed by Mozart with libretto by da Ponte in 1786 and was premiered in May that year in the Burgtheater in Vienna. It was presented in Prague towards the end of that year. The plot was based on an existing play by Beaumarchais, which da Ponte adapted, removing all political comment while leaving plenty of wholesome fun based on the ways of the upper classes and their servants. The opera was a success and had generally good reviews from the press and fellow composers, but it was largely ignored during the 19th century, at least in the English-speaking world, leaving just a handful of arias and the overture as concert numbers. Mozart was born in Salzburg, 1756 and died in Vienna 1791. He was a boy prodigy, performing and composing at an early age. His parents fostered his talents and in his short frenetic life, constantly dogged with money worries, he composed a huge amount of music, still very much appreciated today. STILL WIE DIE NACHT (Carl Bohm) Sung by Jacques Urlus. Edison 28254. March 1917. The composer of this song was born in 1844 and died in 1920. He was one of the most popular composers of his time and besides songs, he wrote a very large amount of chamber music, probably leaving his stamp on the feel of the music of his day, This hauntingly beautiful song is profoundly and attractively German in quality and bears repeated audition. Will ich dein eigen sein. I will be thine own. AN DER ISAR – LÄNDLER played by the Oberbayerische Bauerkapelle. Edison 26208. April 1921.The Ländler is a country-dance in ¾ time, which was popular in southern Germany, Switzerland and Austria in the 18th century. 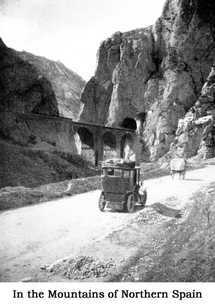 It was taken up by city people and refined, attracting the attention of composers such as Beethoven, Schubert, Mahler and many others. In spite of its rustic features of hopping and stamping, it is widely regarded as one of the ancestors to the waltz, and the city version is a most graceful and appealing dance of which Joseph Lanner (1801-43) wrote many delightful examples. Johann Strauss the elder and he were great rivals in Vienna for the public’s adulation. On this record, the Oberbayerische Bauerkapelle give us a version which, while it has some of the grace of the Viennese variety, nevertheless, still makes us think of a barn dance. TRINK’N WIR NOCH ‘N TRÖPFCHEN (Reutter) Sung by Oscar Stolberg. Edison 26183, first released in April 1911. This title translates as “Let’s Have Another Little Drop” and is a classic German drinking song. It is still available on CD off the Internet. It has four verses and all but the second come back to the varied pleasures of drinking. 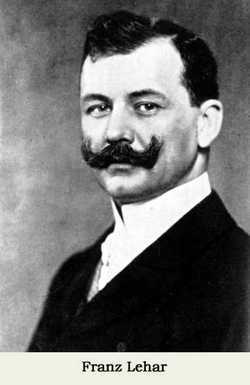 In the second verse, a music master despairs of his pretty students progress and suggests that kissing in the dark would be more fun!Oscar Stolberg was born in Bremen, North Germany and from about 1890 onwards, had a busy career in the music halls of Germany, England and New York. L’EXPRESS ORIENT – Galop Imitatif (Boisson) Musique de la Garde Républicaine. Edison 27048, first released in June 1910. All good things must come to an end, and it is time to start for home on our imaginary trip. For 1883 to 1914, the Orient Express ran between Paris and Constantinople via Strasbourg, Munich, Vienna, Budapest and Bucharest. It is useful to us for this stage of the tour, because we can now send, in accordance with the custom of the time, our chauffeur home with the car, and can ourselves return in great comfort directly to Paris, whence we can take the Boat Train for London. This record is what is known in English as a Descriptive Sketch, whereby an event or story is described with music, sound effects, and voices where necessary. The band of the Garde Républicaine was formed under Napoleon III of France and as the years went by under first-rate conductors, it acquired an international reputation for excellence. The organisation came on tour to London a couple of times during our period. 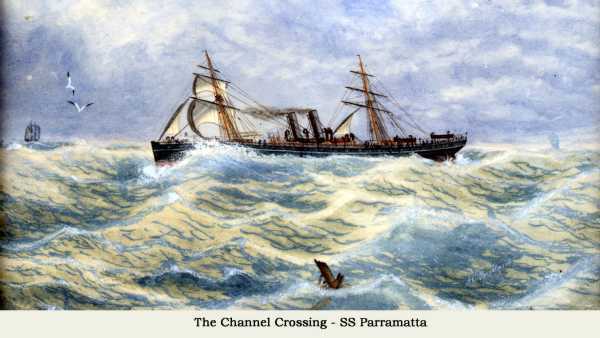 CASEY CROSSING THE CHANNEL – A descriptive selection written by Russell Hunting and spoken by him on Edison Bell, recorded in March 1904. Russell Hunting was one of the pioneers of the record industry, both as recording engineer, singer, raconteur and business manager. He was famous for his Casey sketches, which feature an Irish character, wily and amiable, but a little naïve. Some are dull and formulaic, but others are quite entertaining; it all depends on your taste. His sketch on this record leads us back across the Channel, (albeit in the wrong direction). He bids farewell to his wife in England, full of bravado at the prospect of all the pretty girls in Paris, and embarks. As the ship hits the open sea, the spray of the waves breaking across the bow of the ship is cleverly represented by someone hissing into a horn or trumpet without the mouthpiece. As this noise, and consequently the motion of the ship gets stronger, so our Casey comes over all funny and is ill for the rest of the crossing.